It wasn’t exactly a kidnapping, but it was a crime, and it was the theft of a baby—of sorts. The perpetrator will have to answer to Earthly authorities, at the very least. Whatever the legal penalties, the embarrassment of explaining the act will probably be more painful. 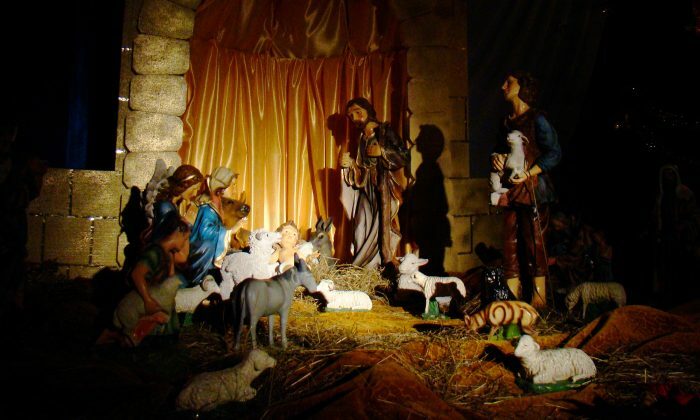 For the Wisconsin woman who got caught stealing the figurine of baby Jesus from a park’s nativity scene in West Bend, Wisconsin, there can’t be a lot of sound explanations. The 21-year-old woman, a resident of West Bend, was spotted by police officers carrying the figurine down North Main Street in this town of 31,000 inhabitants, 40 miles north of Milwaukee. In a town that small, not many people are out and about at 2 a.m. on Christmas Eve. Women walking at 2 a.m. holding statues from holiday displays are rarer still. When the officer asked her to stop, the woman dropped the figurine and fled. The officer chased her down and arrested her. The woman was booked at Washington County Jail on charges of theft and obstructing an officer. The figure she had stolen came from the town’s traditional nativity display, which had been set up each year in Old Settlers Park ever since it was donated to the city in the 1960s. The statue of the baby Jesus the woman was carrying was not the one originally donated to the town. That statue had been damaged by vandals on the night of Dec. 17. The vandals had removed the head and arms from the statue. One of the arms was later recovered. Nothing like that had ever happened before. A local had donated a replacement Jesus figurine so the Christmas display could be complete. Police are not sure if the woman in custody was in some way related to the vandals who damaged the original statue. The West Bend Police Department posted a description of the crime on their Facebook site. The post drew some interesting responses—none of them favoring the thief.